After earning his Ph.D. in biochemistry from the University of Glasgow and post-doctoral training in molecular virology at The Rockefeller University, Dr. Nigel Fraser began his prestigious career as an Assistant Professor at The Wistar Institute in Philadelphia in 1978. He was promoted to Associate Professor in 1983 and to Professor in 1988. He served as Chairman of the Virology Program at the Wistar from 1991-1996. 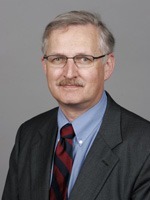 Since 1993, his primary appointment has been Professor of Microbiology at the University of Pennsylvania School of Medicine. He also holds a secondary appointment as Professor of Pathology in the School of Veterinary Medicine at the University of Pennsylvania. Dr. Fraser has been at the forefront of herpes simplex virus (HSV) research for the past 30 years. After first demonstrating the presence of HSV DNA in human brain tissue, he then applied the techniques of molecular biology to murine models of viral latency in the peripheral and central nervous system. Using these murine HSV infection models, he demonstrated that the physical state of the latent viral genome is episomal and not integrated. He subsequently showed that this latent viral DNA contains nucleosomes and has a chromatin structure with transcriptional regulation similar to that of cellular DNA. Currently, his research group is examining the mechanisms by which cellular histone proteins associate with the viral genome and how they function to regulate gene expression. After determining the physical state of the latent viral genome, Dr. Fraser’s laboratory went on to characterize the latency-associated transcripts (LATs), which were observed in latently infected neurons. Early in situ hybridization studies mapped these unstable LATs to about 10% of the viral genome, however, using northern blot hybridization technology, Nigel’s group mapped three transcripts of 2 kb, 1.5 kb, and 1.45 kb to about 3% of the viral genome. These transcripts were stable, localized to the nucleus, and non-polyadenylated. Nigel’s research group also identified a hairpin structure at the 3’ end of the 2 kb LAT and a non-consensus branch-point sequence, which indicated that this 2 kb LAT was indeed an intron with unusual stability; it is by far the most stable intron yet identified. After characterizing transcription from the latent viral genome, Nigel went on to investigate LAT function by constructing mutant viruses that did not produce these transcripts. The LAT-negative mutants were found to reactivate much more slowly from latency, indicating that at least one LAT function is involved in reactivation. His research group also showed that LAT has anti-apoptotic functions which appear to be important in maintaining survival of the infected neuron. The maintenance of this latent state may be mediated through microRNAs encoded by the LAT gene, which may function to prevent the infected neuron from undergoing apoptosis. Dr. Fraser’s more recent research projects are applying this enormous knowledge of HSV to the development of recombinant herpesvirus vectors for therapeutic uses in the central nervous system. These viral vectors may have applications both in gene transfer and in therapy for brain tumors. Nigel’s group has been using HSV mutants (Vmw65 and ICP34.5) which replicate in and kill transformed cells, as well as in experimental brain tumors in mice, while remaining replication defective in the surrounding nervous system tissue. Conditional replication mutant viruses such as these hold great promise as therapeutic treatments for human brain tumors. It is clear that these exciting translational applications would never have been possible without an understanding of the basic science mechanisms involved in viral latency, reactivation, and neuropathogenesis first discovered in the Fraser laboratory. Dr. Fraser truly represents another great example of a Paradigm Builder and has been selected by the ISNV to give the third presentation in this relatively new lectureship series. The Society congratulates Dr. Fraser for his many outstanding scientific achievements.